My home county has a great community college and one that has been a significant part of our family’s life. Phil attended the school to earn his radiology technologist certification and we’re hoping the kiddos will be there taking college courses during their high school years. My mother-in-law has worked in the IT department for years and Hannah and Brody grew up visiting Lakeland and stopping by to see Grandma Cathy while they were there. 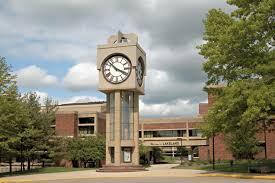 If you’re from the area, you may recognize the great clocktower that is at the heart of the college. Lakeland is holding their 2nd annual Clocktower Run on Sunday, October 5th at 8:30am. Race entry is just $15 for early registrants and $20 on race day. There’s also an option to walk (with your leashed dog if you like!) for $12. If you’ve never visited the area before, Lakeland has a beautiful campus, surrounded by foliage that is sure to be in full fall colors by October. Giveaway entries will be accepted through Tuesday, September 9th at midnight EST. Winning entry will be chosen at random on Wednesday, September 10th and winner will be notified by email.